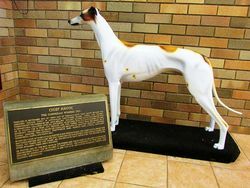 A life size memorial of Chief Havoc , a champion greyhound dog. Chief Havoc is undoubtedly the most outstanding racing greyhound of New South Wales and probably the nation, holding national records in the 500, 660, 700, 750 and 800 yard runs. Racing against the clock in a solo run, the Chief broke many records in front of an amazing crowd of 17,000 people at Harold Park in 1947. This level of achievement was, and still is, unprecedented in the sport of greyhound racing. 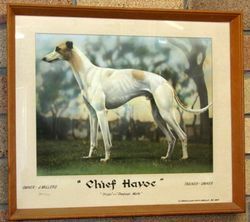 Born and bred by the Swain family of Manilla near Tamworth, Chief Havoc was raised as a pup on a property called "Glen Iris". 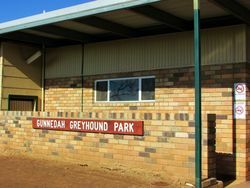 Jack Millerd, originally from Werris Creek, purchased the young pup then moved to Gunnedah, where the Chief was trained in the family backyard. His first win was at the Grafton track, were he smashed the 440 yard record, setting the foundations for what was soon to become his status as a local legend. Like most sporting legends, the Chief experienced setbacks. After breaking many records and winning most races, he intimidated the competition so much that other trainers refused to enter their dogs against him. Chief Havoc was forced to retire to stud, having won 26 races and being unplaced in only 2 of his 36 starts. In total he broke 20 Australian records, running his last race in 1948 at Harold Park. Chief Havoc has been inducted into the Australian Hall of Fame and unbelievably, although he never raced overseas, he is also included in the American Greyhound Racing Hall of Fame. Whelped in September 1944, by Trion out of Thelma`s Mate, Chief Havoc became the greatest success story in Australian Greyhound racing. Owned and trained throughout his career by Mr. Jack Millerd, "Patches" as Chief Havoc was known, was a sensational galloper over all distances. He retired witt the outstanding figures of 36 starts for 26 wins, five seconds and two thirds. These were recorded on 15 different tracks and he broke or equalled records at Grafton, Cessnock, Gosford, Casino, Lismore, Wollongong, Wentworth Park, Harold Park (twice), Maitland, Tamworth, Dapto and Bathurst. In one solo run at Harold Park before 17,000 people in May, 1947, Chief Havoc broke the 440 yards record, equalled the 500 yards record and set new times for 660 yards, 700 yards, 750 yards and 800 yards. His descendants have rewritten the record book often breaking their sire`s records. He proved one of the best sires in the world and the bloodline of most Australian Greyhounds today can be traced to Chief Havoc. 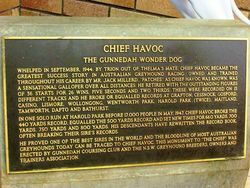 This monument to "Chief Havoc" was erected by Gunnedah Coursing Club and the N.S.W. Greyhound Breeders, Owners and Trainers Association.